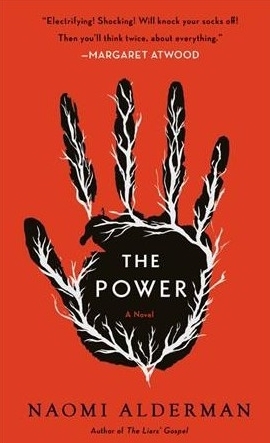 I’ve been wanting to read The Power since before it was written. Ever since I lived and traveled abroad for the first time, years ago, and found out how limited I am and how threatening everything is. I can never let down my guard. My only defense is avoiding danger to begin with. I have a bright red trenchcoat. I don’t usually wear bright colors but I got it for free and it’s cute. The number of comments I get from men on the street just about doubles when I wear it, and I remember why I wear black and gray. If I could give those men a bit of a zap, just to let them know that what they’re saying to me is fucked up, to not let them get away with it, that would make a huge difference in my day and in my wardrobe. I used to think I was alone in this feeling, that I had to explain to people what happened and what it felt like to be harassed on the street. Now, it is known, and things are beginning to change. But to what extent? How much power has lain dormant in women's bodies, yet to be discovered? The Power did for me what the new Wonder Woman movie did for everyone else. Some people were moved to tears in the first five minutes of the film. I was not. It didn’t strike me that way. She was beautiful and thin, basically wearing a swimsuit the whole time, and a superhero descended from a god. In The Power, all the women in the word discover that they contain the power of electricity in their bodies. They basically all become superheroes—fully clothed, regular-looking women superheroes. This book didn’t make me cry. But it made me feel empowered. And then it turned that empowerment on its head. For the first hudered pages or so, it was uber feminist —so much so that some of my freinds (who are feminist) couldn’t get through it. It was too obvious, too cliche. I noticed that, too, but was so thrilled by thought of being filled with power myself, how I would love to walk through the world without fear, that I plowed on, hungry for more zaps. But, around the hundred page mark, things start to go sour. What do people do when they find themselves suddenly in possession of considerable amounts of power? They use it. They use it to feel safe after being vulnerable for so long. And they can never have enough power, never enough safety. Reality gets turned on its head. Alderman considers every possible ramification of this power, and the result is that the world is the same, but opposite. The narrative unfolds masterfully and I was kept guessing—in every scene, I knew there was more going on, more that would happen, and I didn’t know what. Alderman knows what information she is withholding and what information she will bestow upon the reader. She has full command of the story. In a way, this is the story of The Handmaid’s Tale, but modernized. What seems simple in the beginning is endlessly complicated. That’s how I like my literature: exploring the gray, taking no sides, sharing the best and the worst of all perspectives. And, of course, examining the past and future and how the current narrative nestles in between them. I could offer criticism, but I think that what the novel achieves is too important for me to want to share anything more than the combination of empowerment and complication I experienced. It's the best book about women's matters that I've ever read. I can’t find anyone who loves this book as much as I do. If you love it, too, please tell me so I’m not alone.